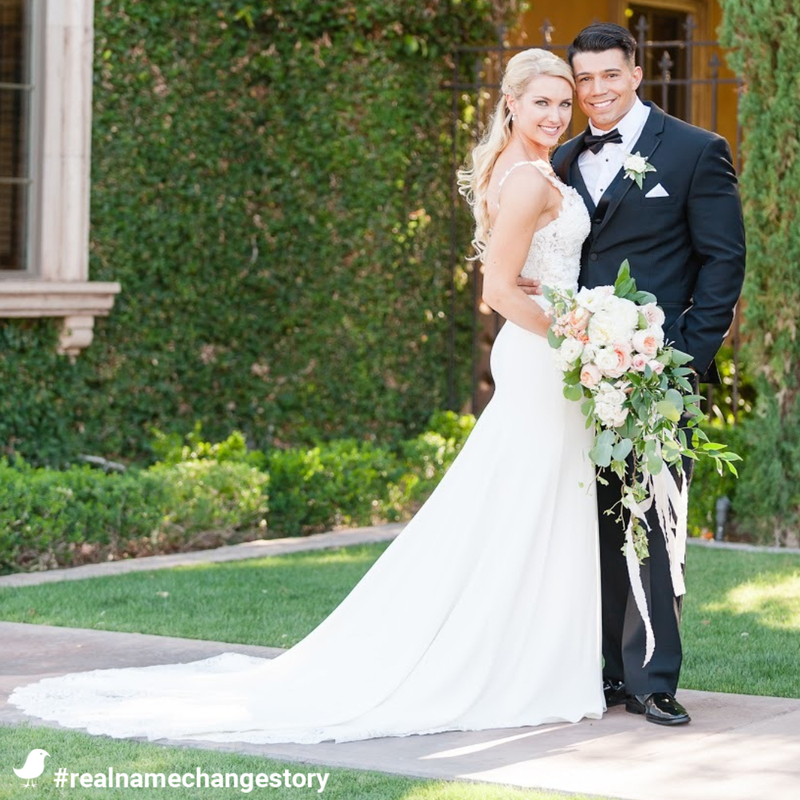 We couldn’t be happier to share Kelsey K’s real name change story. 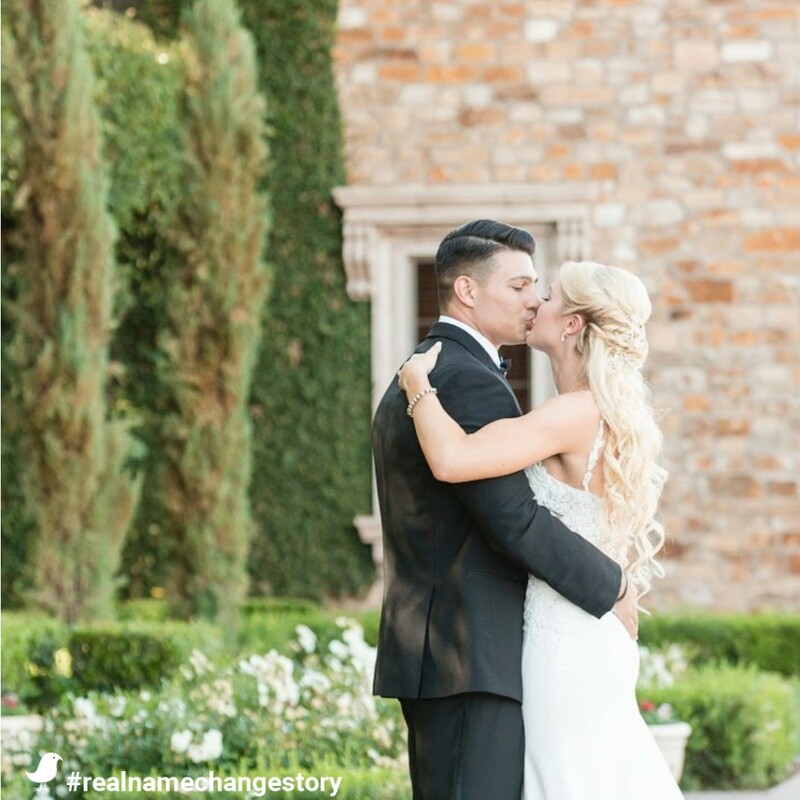 Read on to learn how alumni from rival schools became neighbors, fell in love, created the perfect DIY wedding, and the name change moment it took for Kelsey to sincerely feel the reality of being married! My husband, Orlando, and I met when I had moved into a new condo and he was my neighbor. He had recently graduated from the University of Arizona and I was finishing my degree from Arizona State University (rival schools). We had dated for four years, when he finally proposed to me during our anniversary vacation to Sedona, AZ. We ended up having a longer engagement, 19 months, because I’m one of those “DIY brides” and wanted plenty of time to make my dream wedding a reality. Our wedding day was perfect, everything I had imagined and more. For me, it’s all about the little details and I wanted a romantic theme with lush florals full of garden roses and greenery. I had our monogram displayed on all signage, the aisle runner, our cake, light up on the wall and all the guest favors. One of my favorite moments was when they brought out the groom’s cake, surprising Orlando. It was designed in the shape of a football and had his university’s logo displayed. Just as him and many of the guest (almost all of his friends attending were University of Arizona alumni, many including himself were on the football team) began to chant… he cut into the cake to reveal the colors of maroon and gold. Those are the colors of their rival school, ASU. Myself, many of my friends and family had attended ASU, so we began to chant over the shocked wildcat alumni. From the beginning I knew I would change my name. I love monograms and had already began collecting anything with a “V” for my new last name. 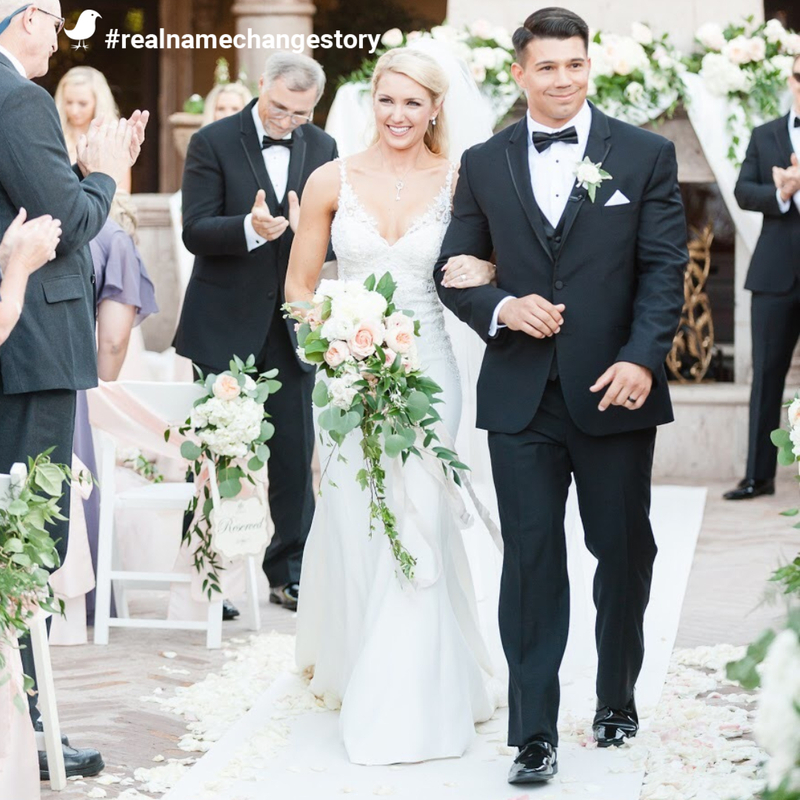 Until you change your name, your wedding almost still feels like a dream. You said your “I do’s” and signed the papers but it’s not until I started to see my new last name appear on my license and credit card that it actually hits you as a reality. The hardest part of my name change was, “where do I start? And what order does everything need to happen in?” I had worried that once I started to change some of my documents, if I hadn’t made the switch in everything else right away it could cause some sort of issue down the road. I wanted to have it all done at once and as easiest as possible. I had no idea where to begin and MissNowMrs made the whole process seem so simple. It’s literally a step by step guide that makes it impossible for you to miss anything or mess up. I purposely had been putting off changing my name because I felt like it would be so difficult. Thankfully, MissNowMrs made it stress free. My advice for newlyweds would be to really take time and cherish your new relationship as husband and wife. Time flies by and before you know it you’ll be celebrating your anniversaries.